Latex paints differ in their formulation, composition and viscosity. In the manufacturing process, many latex paints have coarse ground resins and pigments, unlike other coatings where the resins and pigments are finely ground. The reason is that latex paint is generally made to be brushed, rolled or applied with airless spray technology rather than an air atomizing technology such as HVLP. 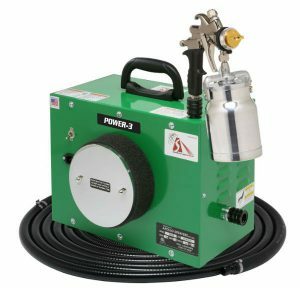 HVLP sprayers vary widely in the available nozzle pressure. Smaller, lower powered, less expensive HVLP turbine units do not have the pressure necessary to apply a generally acceptable smooth finish. While you might get the paint to come out of the spray gun with a low powered HVLP system, application speed will be slow and the finished surface either wavy (orange peel) or coarse. Thinning the paint is necessary to improve the ability of the equipment to atomize the paint better and the addition of a latex conditioner (Floetrol) will assist in helping the finish flow and level better. How much you need to thin the product will depend on the size of the turbine unit, available pressure, and the quality of the paint selected. This will vary anywhere from 10% to 50%. The downside of thinning latex paint is loss of sheen. A gloss sheen can become virtually a flat sheen with excessive thinning. Slower drying and multiple applications are also issues. On the brighter side, newer more powerful turbines (4 and 5 stage units) that put out much higher atomizing pressure allow less thinning (10% or less) and excellent results.